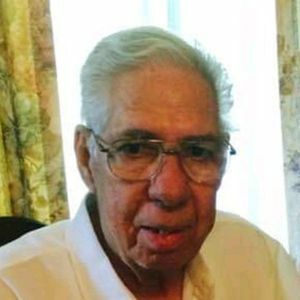 A resident of Walker, Louis Lamonte passed away at home March 16, 2019. He was 89 and a Navy veteran. He went on to enjoy a life-long barber career, retiring after 35 years from the Baton Rouge City Club. Devoted family man and father of four. Survived by daughters; Dolores Whittemore (Tim), Anna Desselles, Rachel Farris, and son; Pete Lamonte. Five grandchildren; Jessica and Derek Desselles, Joseph Oddo, Austin and Hunter Farris, plus a bonus grandchild Tim Whittemore, Jr., Two great-grandchildren, Lila and Venora Oddo. Louis had a very large, close, loving family. Surviving him are his two sisters: Mary Lamonte Bussen and Anne Lamonte Byer; a brother, Sam Lamonte (Clara). Preceded in death by his wife of 50 years, Mary Meek Lamonte; his sister, Santa Lamonte Lamonica; brothers, Joseph, John, and Tony Lamonte. His long and accomplished life included many passions: music, painting, cooking, gardening and fishing. A kind, generous and loving personality that will truly be missed. The family would like to thank Ms. Rebecca Horton who was a loving care giver to Mr. Louis at the end of his life. A Visitation for Louis will be held on Wednesday, March 20, 2019 from 9:00 am until 11:00 am at Our Lady of Pompeii Catholic Church in Tickfaw. A Funeral Mass Celebrating Louis' Life will immediately follow visitation at 11:00 am in the church. Interment will follow at Our Lady of Pompeii Catholic Cemetery in Tickfaw. I am sorry to hear of the passing of your father. My prayers are with your family during this time,and as you celibate his life and what he shared with you in his life that you carry with you today. Mr. Louis & I shared office space at the City Club of Baton Rouge. I was just starting out in my career here & he was so kind. I learned a lot from Mr. Louis about "vitamin C" and fishing. To his loved ones, he has been missed here at the Club. So sorry to hear about the death of your dad. I am sure he is fishing and helping Mrs. Mary with her garden. He will be missed.